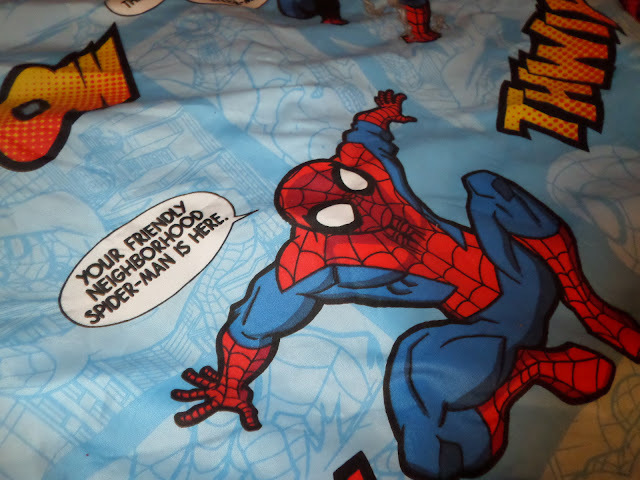 Where Roots And Wings Entwine: Spiderman bedding - a splash of superhero. 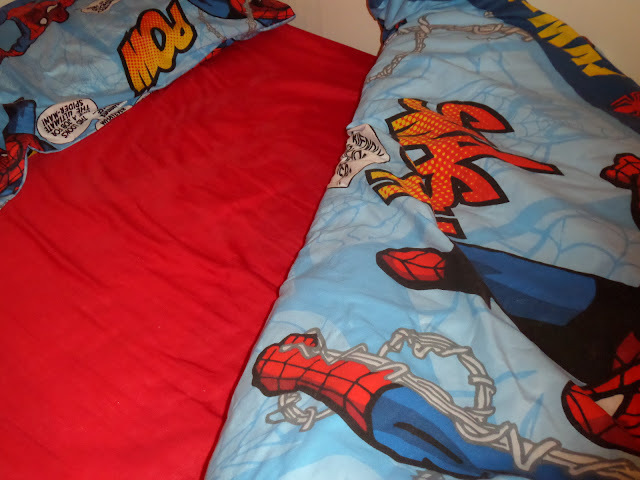 Spiderman bedding - a splash of superhero. As I have previously mentioned we are slowly transforming Bug’s bedroom so that it is a bedroom filled with all that he loves, a bedroom fit for the big boy that he is now. A big part of the room transformation was to replace Bug’s cotbed with a new big boy bed, with other additions being superhero themed accessories to add life and character to the bedroom. One of the latest additions to Bug’s bedroom is a new duvet and pillow case set perfect for our little superhero fan. 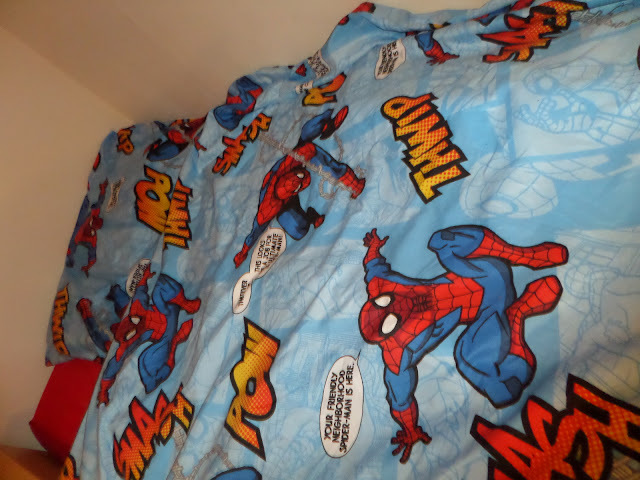 As Bug is mad about Spiderman we bought him a Disney Spiderman Bedding Set from Homebase. 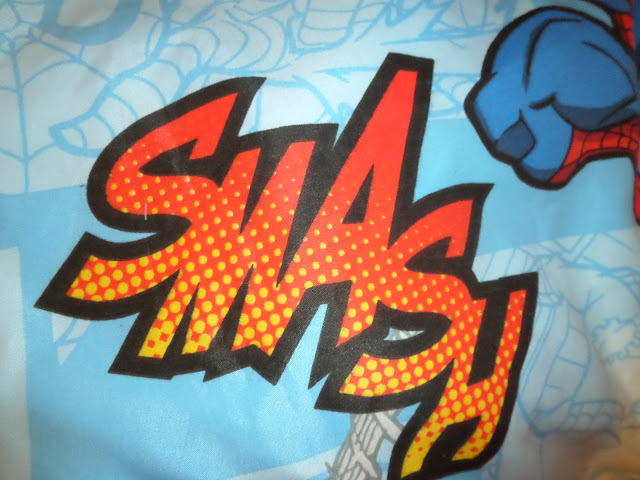 The duvet cover and pillow case is of great quality, with vibrant colours and colourful comic illustrations of Spiderman and superhero comic wording. Along with the Spiderman bedding set we also bought a vibrant red fitted single sheet from Homebase online. The vivid red sheet is a great splash of colour to the bedroom, compliments the lively blue on the Spiderman bedding as well as being the perfect colour for a Spiderman themed bed. Thanks to the Spiderman bedding from Homebase, Bug’s bedroom is looking more colourful and vibrant (ideal when we are restricted on decorating thanks to renting) and our superhero fan is happy and content sleeping with a superhero watching over him.